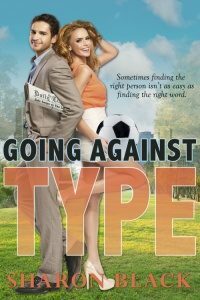 I’m pleased to welcome Sharon Black back to my site today to chat about her romance novel, Going Against Type. This post is part of Sharon’s blog tour- make sure you read to the end to find out all the other tour dates, and to take part in a giveaway. EARLIER this week, I sat and watched Miss Congeniality on DVD. It’s the romantic comedy with Sandra Bullock and, amongst others, Michael Caine. As actors, I adore them both. I’ve seen it before of course. Romantic comedy? I’ll make the popcorn and luxuriate in ninety minutes of sheer escapism. But this time I was watching it through the eyes of my younger daughter, who’s never seen it. When she shrieked with laughter, at the parts that now only make me smile, I found myself laughing again. And it occurred to me that for some of us, romantic comedies may be timeless. Classics, almost. The sort of movies that you can put on, when you need a bit of comfort viewing. Books, of course, are the same. Some of us have favourite novels that we return to again and again through our lives. As a child I read a lot of Enid Blyton and E Nesbit, for example. I still remember particular novels, to which I returned, right through my early years. When I was twelve, I read The Diary of Anne Frank, and found myself rereading this through my early teens. Emotionally connecting with a young girl I’d never met. Who’d lived and died long before I was even born. Drawn in, through her honest outpouring, to the tiny world that became hers. Later, I discovered the wonderful world of romantic comedy. I watched reruns of the great Hollywood romantic comedies of the 1930s and 40s: Adam’s Rib, Shop Around the Corner, Lady Eve, His Girl Friday, and one of my favourites, Woman of the Year. In my early twenties, I discovered great writers of romantic comedy, amongst them Catherine Alliot, and later again, Sophie Kinsella. They became old friends, a pleasure to spend time with in the evening. And, like the ninety minutes of a movie, pure escapism. They are not, of course, my only reading. I read a lot of literary fiction, in particular because I’m part of a great little book club. We read everything from Irish writers like John Banville, Colm Tóibín and Anne Devlin, to American authors like Alice Walker and William Faulkner. In between this reading, I always try to dip into commercial women’s fiction, and if it’s romantic comedy, so much the better. I once read that the world is divided into readers and non-readers. But maybe it doesn’t always have to be the written word first? I know youngsters who won’t read, but love to watch a good comedy or edge-of-the-seat thriller, instinctively understanding story arcs and appreciating well drawn characters. A well written book in their favourite genre, has the potential to convert! For me, a good book or a good movie can be interchangeable. Perhaps because I’m a visual reader. I need to be able to see characters and locations very clearly. And the writer who can do that with the least amount of words or flowery description, will grab me every time. Here’s to the great novelists and the great screenwriters of our time! ‘Maybe another time, so. We’re actually going Greek tonight,’ Derry deadpanned. Charlotte smiled and snuck a glance over at him from the passenger seat of his twelve year old, very beautiful Ferrari. She placed her hands tentatively over her stomach, trying to calm her nerves. She’d spend an hour readying herself, much to Helen’s amusement. I’m not sure what he expects, but I’m not his type, Helen. I’m floundering.’ Helen caught Charlotte’s hands and forced her to meet her gaze. ‘Allow yourself to be a woman! How do I put this without you taking it the wrong way? Don’t talk sport all night. You are incredibly bossy when you start. Let Derry take charge a bit. Allow him to be a man!’ Charlotte blinked. ‘Sorry, I just time travelled to the 1950s for a moment. What were you saying?’ Helen smiled. ‘If his mates are anything like him, they probably wouldn’t know a sports stat from the price of heifers in Mullingar.’ Charlotte sighed. IRISH author Sharon Black is a diehard screwball comedy enthusiast. Her first novel, Going Against Type, a contemporary romantic comedy set in Dublin, was e-published by Tirgearr Publishing in September, 2014 to great reviews. 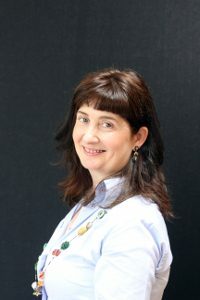 She has had short stories published, and won the 2010 Dromineer Literary Festival short story competition. She worked for a number of national newspapers. She writes a regular blog, This Funny Irish Life, featuring light, fun, personal columns, and tweets at Authorsharonb. When she’s not writing, she reads, walks, sees friends, and drinks far too much coffee. She co-founded a local book club 15 years ago. She loves theatre, old Hollywood films, every romantic comedy ever made, and edgy stand-up. She hates shopping. She lives in a Dublin coastal village, with her husband and their three children. Just wanted to thank you properly for having me here today. It’s the last day of the blog tour, so I hope there’s lots of last-minute entries for the $25 Amazon Giveaway. Also wanted to say that Going Against Type is on sale on Amazon all weekend, at 99c/99p – as a way of wrapping up the blog tour and saying thanks to everyone!